Die-cast badge with ‘J.R.Gaunt’ and ‘London’ embossed lower scroll reverse, left and right. A chained portcullis with a ducal coronet above. A long scroll folded around three sides inscribed Royal Gloucestershire Hussars. This example in gilding metal with two copper loops east-west. 47mm wide by 41mm tall. 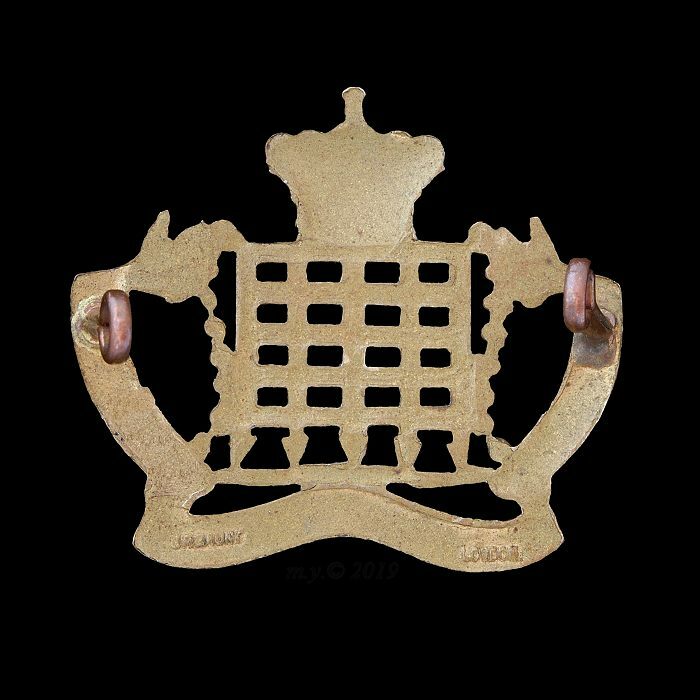 Maker mark to the reverse- J.R.Gaunt London. To Egypt 24th April 1915. Gallipoli, (dismounted) 17th August 1915. Mudros 4th November 1915, then to Egypt 24th Nov 1915. Palestine 1917. Syria October 1918 to June 1919. Transferred to the Tank Corps 14th July 1921, to form 21st Armoured Car Company. Transferred to the Royal Armoured Corps 30th April 1939. 24th August 1939 -duplicate unit formed giving 1st and 2nd RGH. 2nd RGH: 22nd Armoured Brigade 3/9/39-16/9/42 North Africa. Into suspended animation 15th January 1943 and disbanded 1st January 1947. A 3rd RGH was also formed in May 1944 as a dummy tank unit for deception purposes. 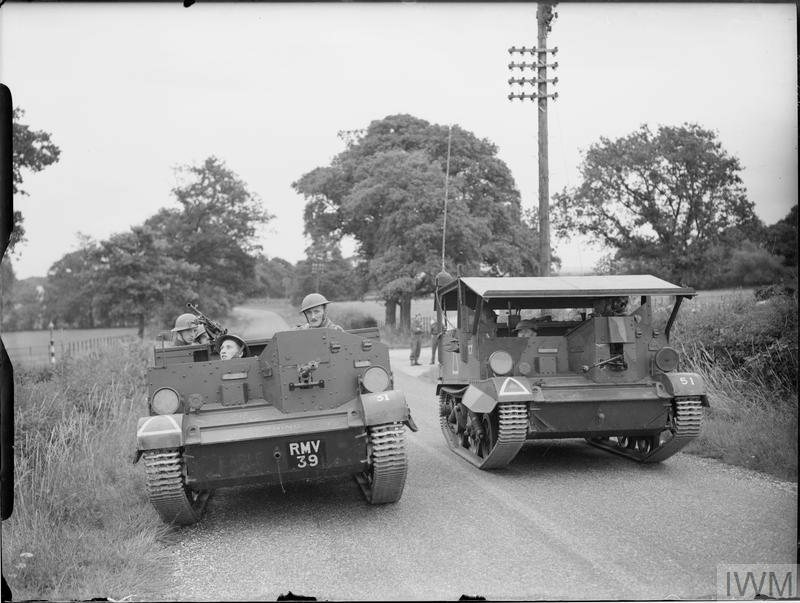 Universal carriers of the 1st Royal Gloucestershire Hussars on exercise near Guildford, 23 July 1940. One of the carriers is equipped with an experimental armoured roof. 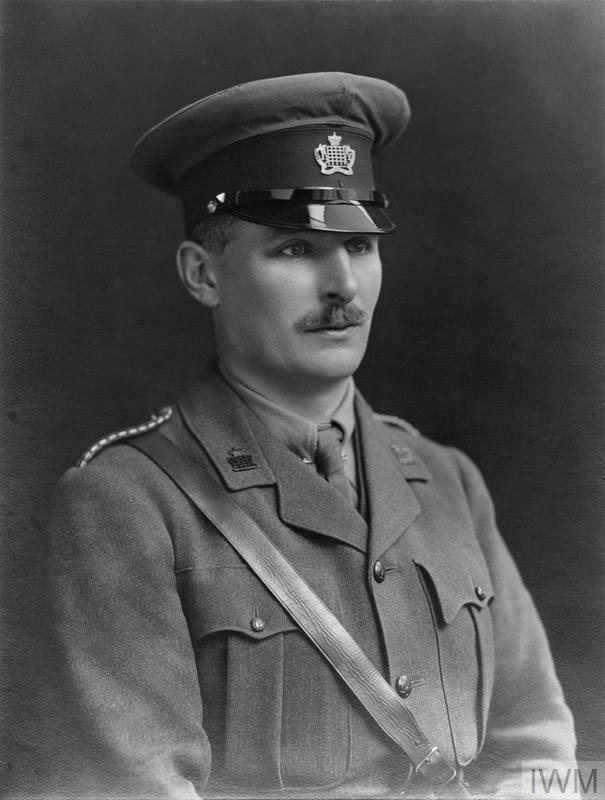 Captain Jonathan Dearman Birchall. 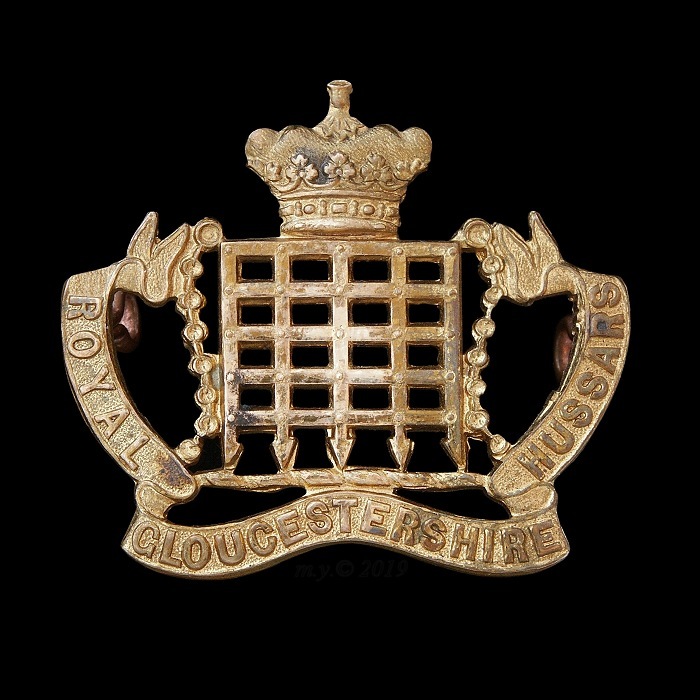 Gloucestershire Yeomanry . This officer is wearing the ‘I.Y.’ Imperial Yeomanry version of the cap badge.